One decade ago, hopes were high for suborbital space tourism. Scaled Composites had performed the first powered test flight of SpaceShipOne in December of 2003, and other than a minor landing mishap, the company seemed to be on track for flying into space in the new year, putting it on the inside track to win the $10-million Ansari X PRIZE before it expired at the end of 2004. That, many believed, would usher in an era of suborbital space tourism by Scaled and other companies, including other X PRIZE competitors, in the following years. The future, though, turned out a little differently. Scaled did win the X PRIZE with SpaceShipOne, performing suborbital flights in late September and early October of 2004 (as well as a test flight in June.) 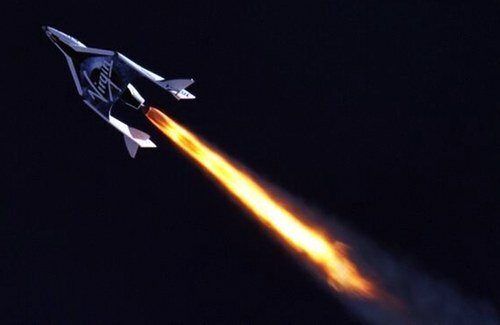 Scaled also announced a deal with Sir Richard Branson’s Virgin Group, establishing a venture called Virgin Galactic that planned to perform flights using a new vehicle, called SpaceShipTwo, as soon as late 2007. But six years after that initial start date, SpaceShipTwo is still not yet in commercial service. Building a new, and bigger, vehicle, with a larger version of the hybrid rocket motor that powered SpaceShipOne has turned out to be a far greater challenge than expected in the heady days of 2004. And the other teams who were competing for the X PRIZE in the early 2000s have largely faded away—the da Vinci Project, anyone? Still, there are signs of optimism for 2014. While development of SpaceShipTwo has been slow, Virgin Galactic did achieve some milestone in 2013, most notably the first powered flight of the vehicle in April. However, more than four months passed before SS2 made a second powered flight, in early September. A third powered flight was reportedly planned for mid-December but scrubbed by poor weather; it’s likely to be rescheduled for early January, after the holiday break ends for Scaled and Virgin. Virgin did put the year’s developments in a positive perspective in a blog post by Branson on Monday, which included a 90-second video recap of highlights of the past year. It also included undated footage of a full-duration (approximately 55 seconds) burn of a hybrid rocket engine on a test stand; that engine has long been perceived as the limiting factor in SpaceShipTwo’s development. “We are truly in the final phase of preparations for commercial service,” George Whitesides, CEO of Virgin Galactic, said in the video. When that commercial service will begin isn’t stated, but the company expects that to be some time in 2014; coverage of Virgin’s deal with NBC Universal to broadcast the first commercial SpaceShipTwo flight mentioned a date of August 2014. That, though, is contingent on Virgin making sufficient progress on the test program, which appears to be going slowly so far. Virgin isn’t the only company in the suborbital spaceflight market. Just down the flightline at Mojave Air and Space Port from Scaled and The Spaceship Company (the Virgin-owned entity that will manufacture SpaceShipTwo and WhiteKnightTwo vehicles), XCOR Aerospace has been working on its Lynx vehicle. Its development has also been slow going, although the company has in recent months been actively blogging work on the Lynx and associated activities, like engine tests. In the company’s most recent release, about a payload integrator agreement with the Czech Space Office, XCOR said flights of the Lynx Mark I prototype will begin in 2014. XCOR is selling seats on the Lynx through another company, Space Expedition Corporation, or SXC. It’s best known for the contest it held in 2013 with Unilever, whose products include Axe deodorants and related products. That worldwide contest culminated earlier this month with Axe Apollo Space Academy, which awarded 23 trips on Lynx flights earlier this month to contestants after a week of testing and training in Florida. Blue Origin is also working, slowly, on a suborbital vehicle. In early December, it issued a press release and held a media teleconference—both rare events for the publicity-averse company—to discuss a test of its BE-3 rocket engine, which flew a simulated suborbital flight profile. Company president Rob Meyerson said suborbital flights of its New Shepard vehicle should begin “in the next several years,” without being more specific. While Blue Origin, Virgin Galactic, and XCOR Aerospace all plan to continue development of their suborbital vehicles for space tourism and research activities in 2014, a fourth company is unlikely to follow. In August, Armadillo Aerospace founder John Carmack said in a speech that his company was out of funds and in “hibernation mode” because of a lack progress after a suborbital test flight in January that suffered a parachute failure. Carmack said the company would remain in hibernation until he found an outside investor or “there’s another liquidity event where I’m comfortable throwing another million dollars a year into things,” as he had previously supported the company with his “crazy money” that he has since exhausted. Masten Space Systems is not in the suborbital space tourism business—its focus is on flying experiments and technology demonstrations—but it has been quietly working on some vehicles. At the Next-Generation Suborbital Researchers Conference (NSRC) in Colorado in June, Masten chief operating officer Sean Mahoney called 2013 “a critical year” for the company as it decides whether to continue work on low-level technology demonstrators or pursue a suborbital vehicle that can fly to 100 kilometers. If the company has made a decision on its direction for 2014, it’s kept that quiet so far. The article linked to in the preceding paragraph also shows how the schedule slips for other companies continue: at NSRC less than seven months ago, Virgin Galactic was predicting test flights of SpaceShipTwo to space by the end of the year, while XCOR said Lynx text flights would begin by late in the year. Neither, though, happened. As 2014 begins, companies continue to promise major developments, but the slow progress and delayed schedules of the past suggest that people should continue to be patient. 1 comment to Year in PReview: is 2014 finally the year suborbital space tourism lifts off? The first rule of engineering applies: Everything takes longer and costs more.